An integrated marketing strategy firm that specializes in revitalizing brands that are stalled, stuck or stale. 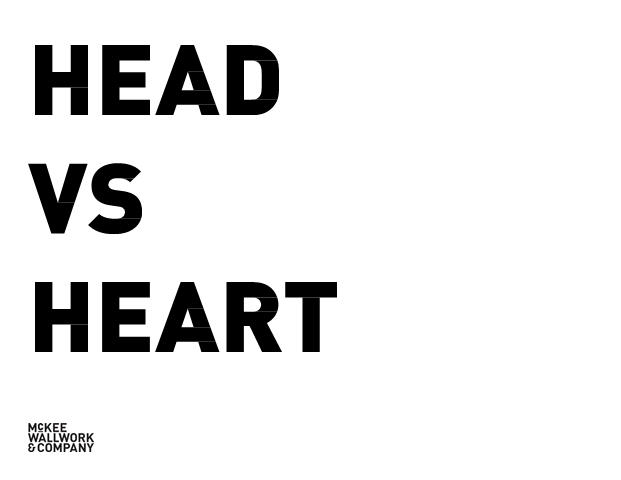 In the age of technology, social media and big data, which one do you use more to make your marketing decisions - your head or your heart? Is it about rational thinking or gut feeling? Which one should it be? Daniel Andreani, Creative Director at McKee Wallwork & Company, will take a look at the fundamentals of brave decision making for your brand. At its core, the webinar is a strong and interactive marketing tool. Through webinar marketing, you can empower your audience with industry insights to earn their trust and gain invaluable ground in building relationships with prospects. Most anyone can create and present a webinar, but creating a successful webinar that generates quality leads for your company is a bit trickier. It requires a solid strategy and implementation plan. You will learn about the five steps involved in creating a webinar-based lead generation program. From integrated marketing strategy, to channel planning and creative development, to an ongoing communication plan, you will learn how to create a webinar program that generates leads and provides you with the tools necessary to convert and keep those leads as customers. First came the Internet and online travel agencies. Then the mortgage meltdown and economic crisis. Ahead of us is a potential fiscal cliff. How can travel agents catch a break? The man who literally wrote the book on turning things around believes that travel agents have the winning formula at their fingertips: customer intimacy. Steve McKee, author of When Growth Stalls, conducted extensive research on stalled companies so he knows how to revitalize them. In this informative webinar, McKee (also a Businessweek.com columnist and founder of one of the top small ad agencies in America) will demonstrate how travel agents can grow big by thinking small, why the best avoid being better, when admitting a negative can be positive, and a host of other eye-opening ideas. What's your "Idea Worth Spreading?" Steve McKee, President of McKee Wallwork Cleveland and author of When Growth Stalls, calls it "SPARK". Some brands go from no-name to big-time almost overnight. Some seem to catch fire out of nowhere. Yet while some hot brands are the result of random chance, others are, in fact, strategically sparked. McKee reveals how much in common physical sparks have with metaphorical sparks--in world history and in marketing history. He then outlines the conditions necessary for ideas to catch fire, and offer principles anyone can use to make their own ideas catch fire. Creativity is energy and energy creates momentum. All great brands have it. The brands that get stuck out there are the ones that do not encourage creativity. In this video interview, Daniel Andreani, Creative Director at McKee Wallwork Cleveland, talks about the evolving role of creativity in integrated marketing. I Hate the Term CRM. It Sounds Like a Disease. At McKee Wallwork Cleveland since 2005, Emily’s responsibility as head of the Integration Architecture department, is to ensure that all elements of a client's marketing program are strategically interwoven. Previously at DDB Worldwide and imc2 (now MEplusYOU), she honed her interactive marketing skills, developing and executing integrated campaigns and CRM programs for American Airlines (AA.com), Pepsi Cola, BLIMPIE and Campbell's Soup Company. Her opinion has been sought by leading industry media, including Advertising Age, AdvertisingCrossing.com, TalentZoo.com, Media Life Magazine and various other news publications. She is a frequent contributor to the Stalled, Stuck or Stale blog.